Alpha Phi Omega (APO) is reaching out to the homeless. 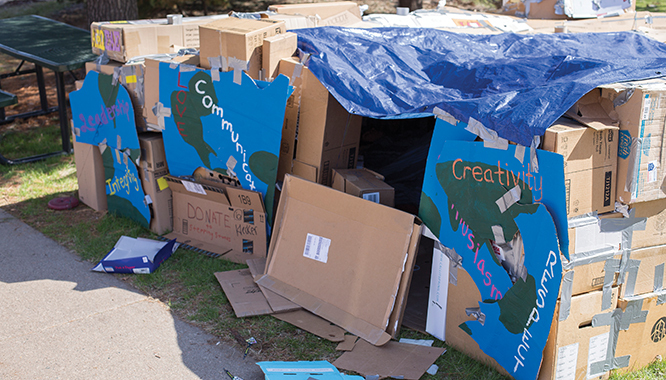 On April 25 and 26, members of the fraternity camped out in a ramshackle cardboard home on the south lawn of the Memorial Student Center for the Cardboard City Challenge. The goal was to raise money to help Stepping Stones, a local food pantry and homeless shelter. One of these campers was fraternity member Kyle Johnson, a junior in the Engineering Technology and Mechanical Design program. According to Johnson, the building blocks, or boxes in this case, were found relatively close to home. “We had to kind of scrounge for boxes from the dorms, the Commons and the MSC,” said Johnson. This sturdy fort was built to demonstrate the trials that homeless people go through every day and, more importantly, every night. Lucky for Johnson who spent that night in the shelter, the weather was kinder than in years past. “Last year we had to call it off 4 hours early due to safety issues,” he said. These safety issues came in the form of inches of snow. The volunteers wisely chose to close up shop a little early that year, but many don’t have any choice on whether or not to sleep outside. Thankfully APO is here to help them out. “APO also works at Thursday Table (an organization that provides a meal free of charge to anyone who wishes to participate) at the First Congregational United Church of Christ to help the homeless,” said Johnson. Thanks to APO, Stepping Stones just got some much-needed support, but most importantly, so did the homeless members of our community in Menomonie.